I like the library network in Paris. With just one membership card, all the public library is accessible and so I can get books out from any of the branches run by the city council. And it’s free! (Membership with access to multimedia costs something like €35 per year – still a bargain if you ask me.) Since I noticed something interesting may be available at the branch of Baudoyer, away I went. Just outside the entrance to the building complex of Mairie du 4ème where the library is housed, there are several interesting and eye-catching Christmas trees at Place Baudoyer. Oh they are festive, green with hints of reds, and fitting as festive decoration. 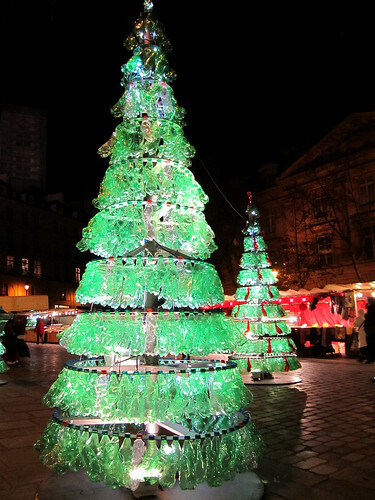 On a closer look though, these trees are made using recycled material. More specifically, plastic bottles of carbonated drinks. How cool is that for an idea and to raise awareness!